Port Hedland and two other ports in Western Australia that account for a major portion of the global seaborne iron ore trade reopened and miners started to return to work on Wednesday after cyclone Christine caused a more than two-day shutdown. Tropical Cyclone Christine, a category three storm which reached the Pilbara region of Australia late Monday forcing the closure of iron ore mines and halting shipments caused only minor infrastructure damage. Port Hedland exports iron ore from mines owned by BHP Billiton (LON:BHP) and Fortescue Metals (ASX:FMG) , the world's number 3 and four exporters of the steelmaking material. The port handled a near-record 22.3 million tonnes of cargo in November which was also a 37% increase over the year before. 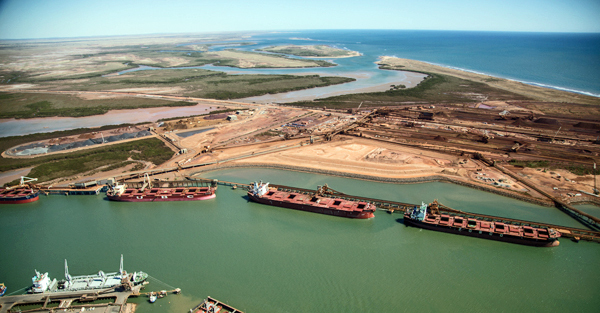 Rio Tinto (LON:RIO), number two iron ore miner behind Brazil's Vale (NYSE:VALE), which is ramping up its annual capacity to 290 million tonnes, exports via the Dampier and Cape Lambert terminals north of Port Hedland. China consumes close to 70% of the 1.1 billion tonne global trade, half of which is exported from Australia. Iron ore is the world's number two seaborne commodity trade after crude oil. The benchmark CFR import price of 62% iron ore fines at China's Tianjin jumped to $134.20 a tonne in anticipation of the weather disruption. The raw material is up sharply since hitting lows of $110.40 a tonne in May last year according to data supplied by The Steel Index.